Deputy sheriff Constance Kopp is outraged to see young women brought into the Hackensack jail over dubious charges of waywardness, incorrigibility, and moral depravity. The strong willed, patriotic Edna Heustis, who left home to work in a munitions factory, certainly doesn’t belong behind bars. And sixteen year old runaway Minnie Davis, with few prospects and fewer friends, shouldn’t be publicly shamed and packed off to a state run reformatory. But such were the laws—and morals—of 1916. Constance uses her authority as deputy sheriff, and occasionally exceeds it, to investigate and defend these women when no one else will. But it's her sister Fleurette who puts Constance's beliefs to the test and forces her to reckon with her own ideas of how a young woman should and shouldn't behave. "In her third Kopp Sisters book, Amy Stewart opens her world beyond the home of the Kopp's and into the wider world of women in the early 20th century. Switching from Constance's first person narration to third person, allowing her to explore the lives of the many types of women that Constance encounters. From the boarding houses of young female factory workers to a traveling theater company to the hearts of young women trying to escape the confines of their family homes, this book brings to life the female struggle in a time when women had little to no rights. Into this world strides Constance Kopp, a woman with a strong moral compass, a fiery will, and a stubbornness that's clearly a family trait. As Constance struggles against the confines society places on women, she fights for the rights of the other women she encounters. In these troubled times, this books serves as a reminder of how far women have come, and that a woman with a will to fight can make a difference, even if one person at a time." "It's been a few years since Kerry Greenwood released a Phryne Fisher book, and I'm so glad Amy Stewart is here to fill that void with the Kopp Sisters. With humor and heart, Constance Kopp works to help women who have been unjustly arrested on morality charges, often guilty of nothing more than leaving home without permission from their parents. Constance sees a bit of herself in these girls, and she's willing to fight for the woman that come through her jail. Though all of her enlightened ideas are tested when Fluerette leaves to travel with a vaudeville show. It's always a treat to spend time with the Kopp sisters, and this is my favorite adventure yet!" "With sharp insight and sly humor, Stewart draws enticing connections between Constance's cases that force her reconsider her own choices—and those of her sisters—in a new light. Even though it's been one hundred years since she was on the case, Constance Kopp is more relevant than ever." "I love Constance and her sisters. They are riotously good fun together. But I admire Constance’s quiet power, no-nonsense style, sharp mind, and her strong desire to find justice for the women who are brought to her jail." "Stewart’s third novel in her clever and original Kopp Sisters series ...is by far the funniest." "Constance's ability to hold her own in male-dominated investigations and courtrooms, as well as her determination to present the facts, makes her a welcome "vision of an entirely different kind of woman," hopefully with more tales to come. Lively and admirable female characters emboldened by their circumstances, impeccably realized and given new life by Stewart." "An intriguing window into women's rights and the social mores that women challenged on the eve of World War I. A lovely addition for series fans and aficionados of historical fiction." "Constance is a blunt, idealistic narrator whose descriptions of the period’s injustices against women, especially in the dehumanizing state reformatory system, are a gripping contrast to Hackensack’s polite society. Perfect for book groups." “Constance Kopp is back, solving mysteries and making headlines! Deputy Kopp is a heroine of her day and continues to inspire today. Whether assisting young girls in finding their footing on a law-abiding path, using her voice to stand up for the voiceless, or fighting crime alongside her all-male counterparts, Constance Kopp is breaking with traditional female roles and navigating sometimes-stormy waters with grace, dignity, and a bit of humor. What does a feminist look like? This is what a feminist looks like!" "A must read for lovers of detective fiction and historical fiction alike." "As with Stewart’s other books featuring the Kopp sisters, one of the most remarkable parts of reading this novel is paging through the author’s afterword, in which she explains the historical basis for her story..."
"A light-hearted historical romp with much zest and ingenuity and a series that begs comparison with the late Sue Grafton’s alphabet series, albeit set in the past, but blending equal thrills with a strong message." "Amy Stewart, who honed her fine research skills on a series of botanical books, has given readers a view of an uncomfortable period in American history. Young women seeking independence in the early years of the 20th century were easily accused of immorality and locked away in reformatories at the least possible hint. They were some of the first victims of women’s drive for independence. The book offers strong storytelling with believable characters. It presents the reader with gritty truths that are seldom comfortable but always intriguing." 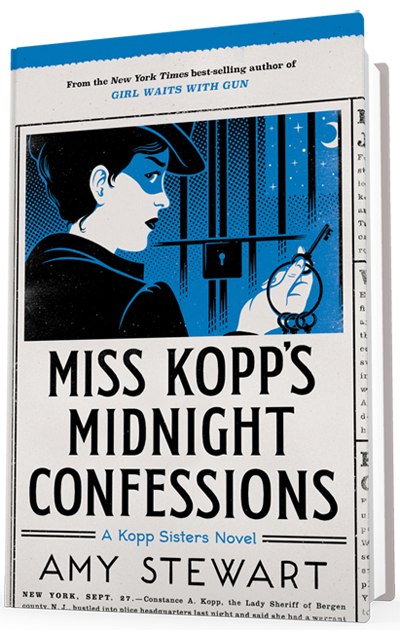 "Miss Kopp’s Midnight Confessions has strong storytelling, believable characters, often uncomfortable truths and the compelling continuing story of one of the great early characters of the women’s independence movement. "